One carelessly uttered sentence had the power to shatter the world as my husband and I knew it. From this moment on, our lives would be filled with medical visits, therapies, and equipment that we couldn’t even imagine we would ever need. It would take a few more weeks to get the exact name of our son’s condition. A few stressful weeks of waiting later, we got the phone call that the neurologist would like us to make the two-hour drive from our home in rural Illinois to Indianapolis. He told us that our son had a very rare genetic condition called Spinal Muscular Atrophy. We had never heard of it. There was no cure, no treatment, and our son would not live to adulthood. Spinal Muscular Atrophy is the number one genetic killer of children under the age of two. We had just lost the genetic lottery! Even worse than hearing this horrible news was telling our parents that their only grandchild had an incurable condition and was going to die. The devastation in the room was thick and weighed heavy on us all. My mother-in-law and I set out to learn everything possible about Spinal Muscular Atrophy. In 1995, that was not an easy task. The doctor had given us a pamphlet with a few blurbs of information. The internet was not widely available to people. There was only one way to find out information. We had to contact organizations like Families of SMA (now Cure SMA) and the MDA and have them mail us information. This was our only way to learn about this rare disease. SMA affects approximately 1 in 10,000 babies, and about 1 in every 50 Americans is a genetic carrier. SMA can affect any race or gender. There are four primary types of SMA—I, II, III, and IV—based on age of onset and highest physical milestone achieved. Individuals with SMA have difficulty performing the basic functions of life, like breathing and swallowing. However, SMA does not affect a person’s ability to think, learn, and build relationships with others. Adam would be classified as SMA type 2. He sat up, crawled, and was briefly able to stand holding on to furniture. 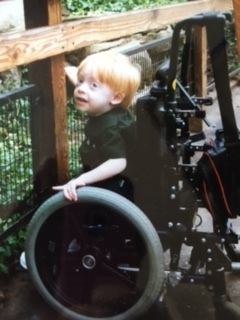 At age three, he would get his first wheelchair. For the next two years, he would blossom as he discovered mobility. We had mistakenly believed that we would make him stronger by forcing him to use a manual wheelchair. In fact, he was using up vital strength that he needed for breathing, learning, and playing. At age five, just in time for kindergarten, he got his first power wheelchair. This was when his personality really developed! He could go where he wanted, when he wanted, all at the touch of a little joystick! One of my favorite memories was sending him to his room for being naughty. Having a child with SMA is hard. We have had to deal with life threatening illnesses from a simple cold. We have spent months in the hospital. We had to make the life or death decision about intubation and eventual tracheostomy multiple times. My personal health has suffered from the years of lack of sleep and stress. SMA has had a life-altering impact on our lives. Our home has to be wheelchair accessible. Our vacations have to be carefully planned and researched to make sure that our son can participate and have fun. We have a team of nurses that give us a break and help us to keep our son healthy. Outings have to be planned with consideration to accessibility, weather, and even the time of year. December to March is flu season and we have to avoid crowds so that he doesn’t get a cold or flu. My son is now 23 years old. The doctors were wrong. He did live to be an adult. Life with SMA type 2 is not all hardship. Our son is highly intelligent and incredibly driven. Having a disability has made him very focused on what is important to him. He wanted to be an Eagle Scout, and he worked hard to accomplish that. He wanted to act in youth theater. He was in 14 productions, working with the directors to find ways to work with the other able-bodied actors. He played competitive boccia, using a specially designed ramp, and was the Illinois State Champion. He has played adaptive softball and soccer. He is currently in college studying computer science. Like everything in life, it’s about balance. There is bad and there is good. At times life is really hard, but there is also so much reward as well. 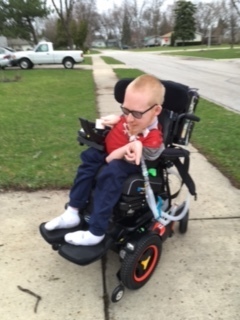 Seeing our son with SMA accomplish so much in spite of all of his limitations makes you realize that the only limitations in life are the ones we place on ourselves. Kimberly Sullivan is the CEO of the Sullivan Family where she manages her husband, son, nurses, and three dogs. Her hobbies include sleeping and chocolate. She details her experiences as the mother of a son with Spinal Muscular Atrophy on her blog, Please Don’t Pet the Special People at ksully357.blogspot.com.